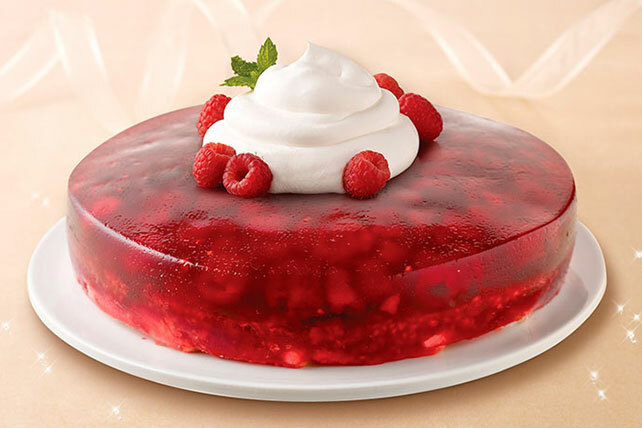 Delight in this Raspberry Angel Cakes' gelatin, raspberries and whipped topping. Our sweetly unique Raspberry Angel Cake is truly heavenly. Add boiling water to gelatin mixes in medium bowl; stir 2 min. until completely dissolved. Add berries; stir until thawed. Pour into 9-inch round pan sprayed with cooking spray. Arrange cake slices in concentric circles over gelatin, with slices overlapping as necessary to completely cover gelatin. Refrigerate 3 hours or until gelatin is firm. Unmold onto plate; top with COOL WHIP. Dip knife in warm water and run knife around edge of chilled dessert to loosen. Dip pan in warm water, just to rim, for 15 sec. Lift from water and gently pull gelatin from edge of pan with moistened fingers. Place serving plate on top of pan. Invert pan and plate and shake to loosen dessert. Gently remove pan.